Another white elephant, look at crossrail project, and it spiralling cost and delays. London Euston to Birmingham New Street is 115 and a bit miles. Virgin’s Pendolinos are booked to take around 1hr 20 mins to do the trip, but they are limited, due to Network Rail’s incompetence, to 125 mph. They can actually run at 140 mph, which by my reckoning, means that they can do the run in about an hour or less, including time to accelerate from Euston, and slow down for the approach to New Street – if Network Rail had carried out the line improvements properly a few years back. Why on earth are we spending a fortune on this white elephant? We ‘suffer’ this crass and expensive stupidity as a result of an ORDER from the Evil Union (EU). The Empress of Greater Germany ordered so-called high-speed rail lines to traverse all of her Empire. The reason: in order that she can despatch units of the Evil Union’s ‘army’ to quell dissent and opposition. PS: I think £100,000,000,000 is a conservative estimate. That will only just about pay the directors salaries, bonuses and ‘perks’. 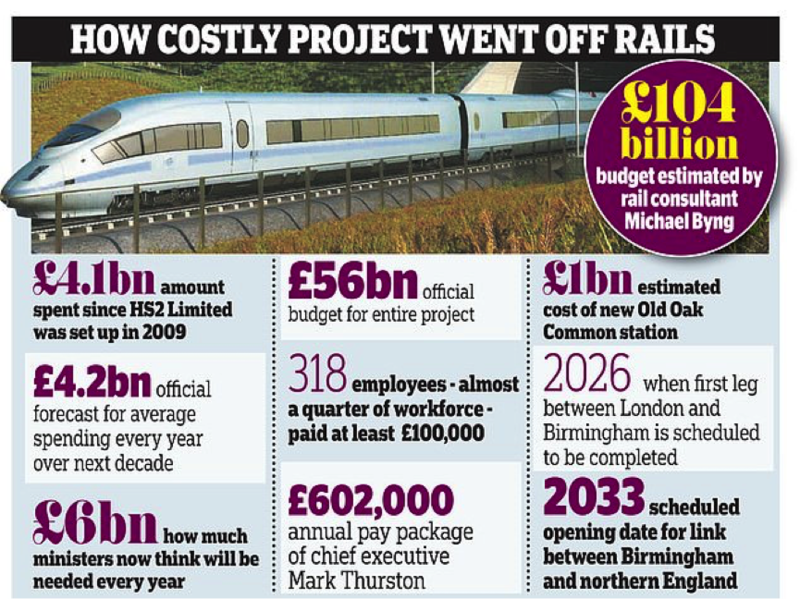 what a bloo-y waste of uk public money, i would rather this money be spent on policing budgets, school budgets, nhs hospital budgets, social care budgets, instead of this white elephant 18 minutes faster to get from watford to birmingham.tory shambles again new money forest needed urgently pm theresa may. And just to add to the HS2 nonsense, there have been reports in recent weeks (since the New Year) that numerous property / land owners on the approved route have still had absolutely no contact about their property being purchased for the project. People have looked at the approved route on scheme plans running straight through their houses yet have had not one visit / phone call / letter from anybody about it. Are the builders just going to turn up with bulldozers and fain surprise that condemned properties are still occupied…? Now that the UK is no longer involved in the EU Strategic Transport Technology Plan (STTP) or involved in the Trans-European Transport Networks policy (TEN-T), surely it’s past time to shelve the HS2 plan (which appears to have been greatly driven by these policies). This entry was posted in Uncategorized and tagged an ORDER from the Evil Union (EU) - The Empress of Greater Germany ordered so-called high-speed rail lines to traverse all of her Empire, HS2 opponents are said to include Theresa May’s deputy David Lidington/ Chief Secretary to the Treasury Liz Truss & Commons Leader Andrea Leadsom. ‘There is concern across government at the wa, interview with Professor Stephen Glaister since he stepped down as chair of the Office of Road and Rail watchdog in December., Mounting Cabinet revolt threatens to sink the HS2 rail link as ministers look to 'kill off' project after budget nearly doubles to £60billion, Now that the UK is no longer involved in the EU Strategic Transport Technology Plan (STTP) or involved in the Trans-European Transport Networks policy (TEN-T) - surely it's past time to shelve the HS2, This would bring the outlay to £64billion – £8billion more than budgeted currently and almost twice the initial budget of £33billion set in 2011. Bookmark the permalink.